IIS Express is a lightweight and tiny version of IIS for developers to run and test the web sites directly from Visual Studio. I hope by this time you must be using it as your default development web sever as well. Just to quick recall; IIS Express was introduced with VS 2010 SP 1, where we used to had both Visual Studio Development Server ( WebDev.WebServer) and IIS Express. 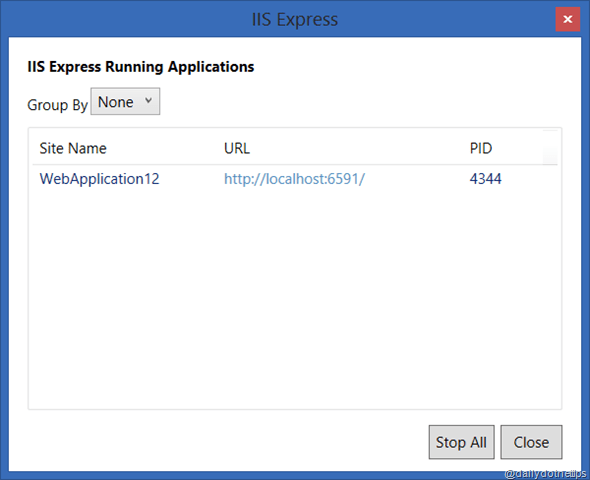 However with the Visual Studio 2013, IIS Express has been set as a default web sever . There are several features of IIS express which you can find very useful and be used in a similar way that we does with IIS . One of the great feature of IIS express is to run your application in both default and SSL mode. You can achieve this very easily . To enable the SSL with in IIS Express, you have to just set “SSL Enabled = true” in the project properties window. With this; you can access any of the URL from your browser and run the application.